A series on my experiences as a new immigrant in Canada. For the little more than two months we’ve been walking around, past, next to it, this modest-looking West Indian restaurant in our neighbourhood in Mississauga has been teasing us. We would see other immigrants, most of them presumably from the Caribbean, going in. We didn’t follow suit. “We will have a treat here once one of us has a job,” my husband kept assuring, and the flickering orange ember peeking out from the restaurant’s counter became a silent sentinel of our pledge. 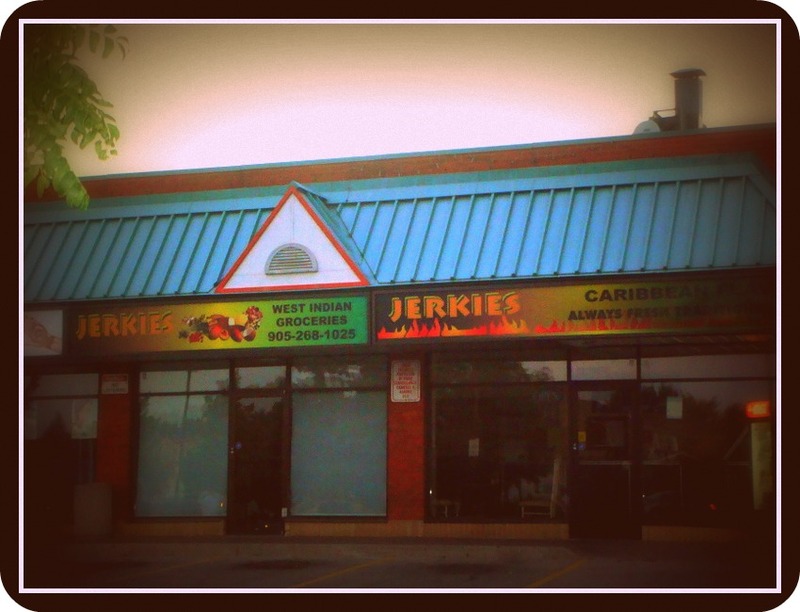 Yesterday evening, on our way back from our customary evening walk, we stepped inside Jerkies. The place wasn’t a cramped hole in the wall–there were five or six tables, enough to seat around 25 people. A crime serial on the lone TV mounted to the wall had two engrossed viewers–a black mother and her young daughter, seated on one of the tables. Right across them was the counter, behind which stood a sanguine black man. When we looked at the menu behind him, written on a blackboard with chalk, there was only one item we were sure of ordering–jerk chicken, and no marks for guessing that. We wondered what the other item should be; I suggested to my husband in Hindi that he ask our sanguine friend. No sooner than he had sought the man’s recommendation, emerged the words, “goat curry.” The confidence on his face and in his baritone sealed his suggestion as our second choice. As we sat down at a table, waiting for our meal to arrive, Dear Husband (DH) and I whispered to each other about the conviction in Sanguine Friend’s voice while advising us to go for goat curry. “It’s one immigrant’s innate understanding of another,” DH said, referring to a West Indian’s confidence in suggesting mutton curry to an Indian. A little later, the red-haired lady who had been so absorbed in watching the crime serial brought us a plate full of rice and beans, salad and jerk chicken. “Who’s having this?” She asked. When I told her it’s me, she put the plate before me and handed me a napkin wrapping the fork and knife. I had barely dug in and given top marks to the very well done jerk chicken when DH’s plate of goat curry with rice-beans and salad came. A few bites and we knew Sanguine Friend’s recommendation totally hit the spot. Tender to the point of falling off the bones, the curry had been spiced in a manner that it could have been cooked by an Indian. Along with our respective dishes, the lady also brought us fried plantains, complimentary. Nice! What looked like too much food when it arrived on the table had been diminished to bare bones within half an hour; such was the fury and enthusiasm of the two eaters.I guess one of them did find a job after two months. “How was the food?” Sanguine Friend asked when we went to pay the bill. “We’ll be back,” DH said with a smile. Sounds like a great meal. Good to learn a job has been secured. Thanks, Terry. Yes, the job news did come as a relief to us too. II am always amazed at your writing Bhaswat! Such a simple subject but so beautiful! I wish I had even a small fraction of such capability! And congratulations on the job! Dear Boisalidi, our admiration is mutual. After looking at your work, I was so amazed. Wish to attend one of your exhibitions sometime. Your encouragement always touches me. Thank you so much! Love you style Bhaswati. You make us see a new experience, taste it. Is this Toronto?